Our new unit is studying caterpillars and butterflies. I put this sensory bin together using mostly items from the dollar store. I made the caterpillars by gluing 5 pompoms together. I bought 2 bags of pompoms (one bright and one pastel) but one bag has enough to make 16 caterpillars. I also cut up a 5yd spool of ribbon into one yard increments for making chrysalises. 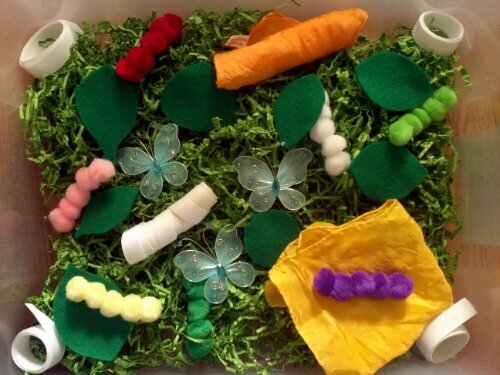 This entry was posted in Sensory Bins, What We're Learning and tagged butterfly, caterpillar, Sensory. Bookmark the permalink.